6050 Ultimate Channel Strip HD features AAX DSP compatibility for ProTools HD systems. The active EQ bands can be controlled via the response plot itself, or from the text readouts above and below the response plot. The AE400’s active EQ response is determined by each band’s threshold, attack and release settings. Additionally, a ratio control determines input signal level sensitivity to further articulate how the active EQ will reach maximum active equalization – a feature unique to the AE400. 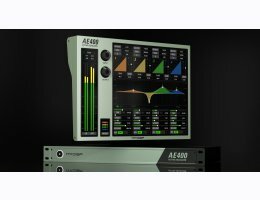 "Download the demo of AE400 Active EQ HD"